Gomti Chakra removes Vastu Dosh : 11 Gomti Chakras are buried in the foundation of the building to bless the residents with long life and prosperity and negate the evil effect of vaastu dosha caused in SE direction. Gomti Chakra appeases Godddess Lakshmi : 7 Gomti Chakras are wrapped in red cloth and kept in lockers or cash box to ensure the blessings of Goddess Lakshmi - the goddess of Wealth. 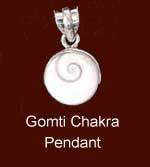 It is believed that those people who possess Gomti Chakra will be blessed with money, good health and prosperity. It is also believed to protect children. In some regions, eleven Gomti Chakras are wrapped in a red cloth and placed in rice or wheat containers. This is for food security. It is used as a Yantra. It is used for Mantra. As it has special powers, many Jain sadhus & sadhviji, use it as a special Yantra, during Pooja. It should be yellowish brown on the back and have white whirls on the top. It must not be tainted or dented. Its circular edges must be smooth and not broken at places. Gomati Shilas are used for placing Shaligrams in some special worship. Gomati Shilas are also used as protective for children. It brings wealth and good health. This is also known as Cow's Eye Shila. Some consider this as Eye of Lord Shiva. These shilas are considered very sacred and beneficial when placed along shaligram as.26 Gomti Chakras are joined together to form a Gomti Shila.